There are many ways to make burgers, but one thing should always be the main ingredient: very lean meat. I don’t eat burgers with bread; but, I can add enough other items to make this filling. Mix the meat and other ingredients then form into balls slightly smaller than tennis balls (we prefer larger burgers and they do “shrink” down a bit while cooking). Flatten for cooking. Cook meat until medium rare, about 2.5-5 minutes (watch meat carefully, as over-cooked venison can becoe very dry). I cook burgers in a pan and put low fat cheese on right before serving, although you can also cook them on a grill. 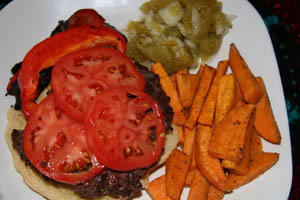 With tomatoes, pickles, onions, catsup and lettuce, I don’t need a bun, but others can use whole wheat. I often stretch the recipe by adding ½ cup of *seasoned (Italian) bread crumbs. Not only does this make more burgers, it also “plumps” them up. If you have kids or picky adults in the house, you can add very finely chopped *spinach to the mixture as a way of sneaking in the vegetable to their diet.